After another six months of discussions, Greek debt negotiations succeeded in once again kicking the can down the road. This column analyses how sophisticated and experienced negotiators like the IMF, the Eurozone leadership, and by now even the Greeks, could have let negotiations drag out for so many years, and goes on to propose a plan which might be just radical enough to meet the needs of all parties. After another six months of discussions, Greek debt negotiations succeeded in once again kicking the can down the road. Europe agreed to ‘lend’ Greece enough to cover the amount it will ‘repay’ to private creditors, the ECB, and IMF next month, plus a bit more to cover interest and the domestic arrears the Greeks have built up in manufacturing their current reported primary surplus. Further resolution is left until after the September German elections, and maybe until as late as April 2019 when some private debt is due. The IMF, which rightfully claims the debt is not sustainable, managed to neither approve nor disapprove of the latest deal. The crazy thing is that the real economic substance of the Greek debt resolution was settled long ago: the Europeans replaced private creditor debt with public sector debt, most of which will realistically never get paid, and also provided the Greeks with the additional funds needed to keep its banks open in the face of significant capital flight as well as some additional funds to permit small primary deficits. The arguments going forward are all about a few billion euros a year in possible repayments as well as aspirational reforms. But politics and accounting have left the parties – the Greeks, the IMF, and the Northern Europeans (Germans) – in a never-ending cycle of frustrating negotiations, unrealistic promises and projections, and short-term fixes.1 Here’s why. The Germans have to worry about any deal setting a precedent for Spain, Italy, and others. This is also why they want to require an IMF sign-off on any new programme. Furthermore, if a settlement allows the Greeks to somehow start borrowing on the private market (mainly by gaining eligibility to the ECB’s quantitative easing programme), then Germany has to worry about being somehow forced to repay that debt, much as they are now stuck with the bill for the 2014 bonds Greece issued long after the bailouts began. It is also difficult to explain to the public large write-offs just before the inevitable new ‘loans’ that will be required in the next few years as private and IMF debts come due. Moreover, an immediate write-down will force the ECB to declare losses that will need to be recapitalized. For all these reasons it is more convenient for Germany to postpone forgiveness or make it gradual. The IMF, its reputation tarnished by signing off on the previous Greek bailouts, is reluctant to bless any deal which it does not believe Greece has at least some chance of being able to honour without further renegotiation, which is why it believes write-offs are necessary. This creates an impasse with the Germans. Chastened by their 2015 experience, the Greek strategy appears to be to agree to anything the Europeans ask so that they don’t get expelled from the Eurozone, and then to renegotiate as deadlines are missed. There is also the following problem: no one wants to admit that Greece is still a developing country. Even if the legislature somehow passed a wholesale adoption of German law, there is a limit to the pace of reform and the ensuing acceleration of economic growth. Southern Italy has the same law and federal government as northern Italy, but its economy has not converged to northern levels. The same with eastern and western Germany, and with the southern US states and the wealthy northeastern ones. So how to cut the Gordian knot? We propose a two-part programme that allows the Germans and the IMF to achieve their primary goals while allowing the Greeks to claim that they have negotiated a significant reduction in their debt obligations. However, we don’t make it possible for the Greeks to resume running primary deficits through new borrowing, which is probably what the Greek government would most like to do. Because payments to private creditors and the IMF will exceed the Greek repayment requirement, the Europeans will inevitably have to lend the Greeks additional money through the ESM over the next few years to make up the shortfall. As Table 1 shows, this would mainly be an issue over the next seven years, most prominently in 2019. 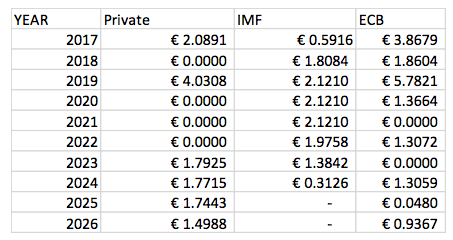 Suppose that in 2019 Greek formula payments were €2.5 billion, and payments to private creditors plus the IMF were €6.15 billion in principal (as in Table 1) and another €1 billion (say) in interest. Then the ESM would lend the Greeks the balance of €4.65 billion. We think of ECB debt as being owed to European governments and this debt also would be either rolled over or replaced by ESM debt. While this part of our proposal addresses cash flow issues, it does not meet the IMF sustainability criterion and theoretically would leave Greece in perpetual debt. It would be clear to the Greeks that if they actually made payments, then this plan would reduce Greek debt to Europe by two thirds regardless of the profile of the debt and the rate used to discount all payments. It would apply to some €231 billion out of €293 billion in face value debt6 that the Wall Street Journal lists as external debt, and so be a reduction of a little over 50% of the total debt, in line with IMF projections of what is realistic. If at any point Greece defaulted on its formula payments, or opted out, it would lose the 3:1 matching on the entire remaining debt. Importantly, staying in would involve simply making payments, not negotiating contentious reform programmes. Greece would become a much more enthusiastic partner. Note however that the debt forgiveness only occurs gradually – in the early years, there will probably be no net repayments to Europe at all, and so no debt reduction. Outstanding debt would remain high. By giving the programme a finite life, of say 50 years, Europeans may be able to avoid taking an immediate write-off and wait until whenever Greece actually makes net repayments. If Greece finally followed through on the ambitious privatisation plan targeted after the financial crisis, the 3 for 1 plan would enable it to generate the revenue to quickly pay down much of the European debt; perhaps more likely it would use the money to boost current spending. Either way, the incentives to sell assets would be vastly greater than now, when proceeds are targeted for payments on an effectively infinite debt. Similarly Greeks might finally have an incentive to pay taxes. An important aspect of our proposal is that new private debt issued by Greece would be junior to all programme debt, which would effectively make new private issuance impossible, unless Greece were granted a variance by its creditors. This prevents Greece from issuing new debt to run deficits that might add to future bailouts. These terms, plus the eligibility requirement that private lenders must first accept 50% haircuts (as lenders to Greece did in 2011), make it unlikely that any other European debtors would seek the same deal. This plan is appropriate for a country like Greece that is so far under water that it cannot reasonably expect to issue new private debt without the implicit guarantee of its old creditors. Our plan sounds radical, but it is not. Others have suggested linking debt payments to GDP. Our spending index is easier to measure, and gives better incentives. Others have suggested making debt forgiveness gradual and conditional on reforms. But reforms are hard to measure, and their implementation pits the Europeans (or IMF) against the Greeks. Making forgiveness conditional on actual payments makes forgiveness gradual and puts Greeks and Europeans on the same page. The constant bargaining, brinksmanship, and uncertainty that have dominated the last seven years have worn on everyone. It is past time to develop and implement economically realistic long-term solutions. Editors’ note: This column is based on CEPR Policy Insight No. 90, available to download here. Schumacher, J and B Weder di Mauro (2015), “Greek Debt Sustainability and Official Crisis Lending”, Brookings Papers on Economic Activity, Fall. For one discussion of the recent history of official lending to Greece since the financial crisis, see Schumacher and Weder di Mauro (2015). The Europeans have restricted the ability of the Greeks to sell T-bills to their banks and other private creditors for fear that new borrowings will later add to the costs of bailing out the banks and the government. As GDP and G rose together, payments would eventually converge to the 3.5% of GDP that the Europeans are demanding. On the other hand, if GDP and G fell by 33%, required payments would be reduced to 0 percent of GDP. Thus payments would automatically adapt to economic performance without the need for more negotiations. Note that we are setting net repayment requirements, not primary surplus targets, though in the long run the two should be broadly similar but for government asset sales and changes in reserves. Net payments should also be much easier to monitor than primary surplus. The €3 billion is applied first to interest owed on European debt and then to principal. New cash forwarded by the Europeans in the early years to pay down private and IMF debts might not be eligible for this relief if including it involved a substantial European accounting problem. Economically it would not matter much. Included (in billions) would be EFSF €131, Eurozone governments €53, ESM €30, ECB €17. Excluded would be IMF €12, private investors €36, T-bills €15 (see https://graphics.wsj.com/greece-debt-timeline/). These totals include the upcoming 2017 payments in Table 1 which will be converted to ESM debt before the next negotiation. Adjusting for the conversion of that hard debt to ESM debt will slightly increase ultimate debt relief and reduce the time before Greece makes net payments to Europe.